Hydraulic Systems For Hook Loaders: Beware The High-Pressure Salesperson Who Tries To Talk You Into A Low-Pressure Type! 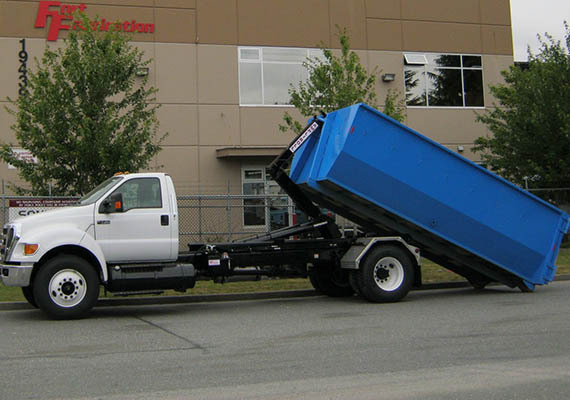 When contemplating the purchase of a hooklift system (to go with a chassis and various roll on/off truck bodies) for your contracting company, municipality, waste-hauling firm or other operation, a major consideration should be the hydraulics. A gear pump serves as the “heart” of any hydraulic system. The pressure it operates under affects the valves and lift cylinders, among other components. Of course, its performance also influences the overall satisfaction you’ll have with your choice in a hooklift-equipped vehicle. There are two types of hydraulic systems used by makers of hook loaders: low-pressure and high-pressure. So, which way do you go? Low-pressure pumps, valves and lift cylinders for hydraulic hooklifts are rated at 3,000-3,500 PSI, at maximum. One benefit of low-pressure systems is that they can employ inexpensive components. The pumps, for example, are generally made of aluminum. “Compatibility” with the other equipment often used with hook loaders is often cited as another benefit to low-pressure systems, but this isn’t really the case. Most hydraulic equipment on roll-on/off truck bodies (e.g., sanders, plows, water tankers and more) requires the use of pressure-reducing valves no matter what type of hydraulic pump you use. Many advocates of low-pressure systems point to the aluminum pump and claim that lighter weight is an advantage. But again, that’s not necessarily true. One fact overlooked by many is that low-pressure components must be sized larger than those for high-pressure systems to produce the same force. This also requires many parts to be heavier and bigger than those on comparable high-pressure units. A final “con” to low-pressure systems? They’re inefficient by design and, in fact, can usually approach only 50% efficiency. This means greater heat generation, wasted horsepower and higher fuel consumption. The bottom line? Given these plusses and minuses, low-pressure systems are used today by very few hooklift manufacturers in the U.S.A. While slightly more complex than their low-pressure counterparts, high-pressure hydraulic systems are currently in use by about 75% of hook loader manufacturers in America and around the world. In fact, they’re considered by most industry experts as the best technology when building any type of hydraulic-powered equipment. Why? Consider the piston pumps used in high-pressure systems. They can approach efficiencies of up to 85% — meaning lower heat, less wasted energy and reduced fuel consumption. Other “plusses?” Lift cylinders are made of thin, high-strength steel and are generally much smaller in size and weight in comparison to a low-pressure cylinder with the same force rating. What’s more, high-pressure piston pumps only require clean, contaminate-free oil to operate correctly over their entire life expectancy. The winner is … you, if your selection is a high-pressure system for your hook loader! After all, there’s is a big reason why the construction industry — hooklift makers included — is moving to high-pressure systems, and that’s money. These systems cut maintenance costs, reduce fuel consumption, save weight and achieve production efficiencies unmatched by low-pressure hydraulics! So, if someone tries to tell you that low-pressure systems are the way to go with a hooklift, ask them why is the world moving in the other direction with second-generation, high-pressure hydraulics? Ampliroll Hooklift Systems are manufactured by Marrel – the inventor of the dual-pivot hook loader in 1969 and first again in bringing them to users across the U.S. in 1980. 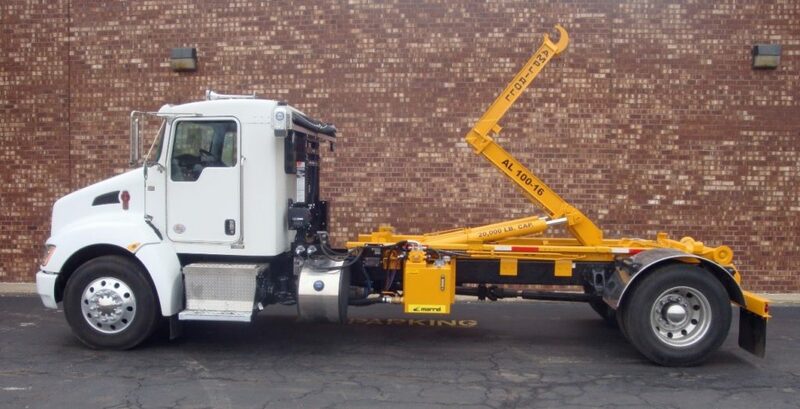 Today, Ampliroll is the only supplier in the USA of premier hook loader systems and associated equipment.